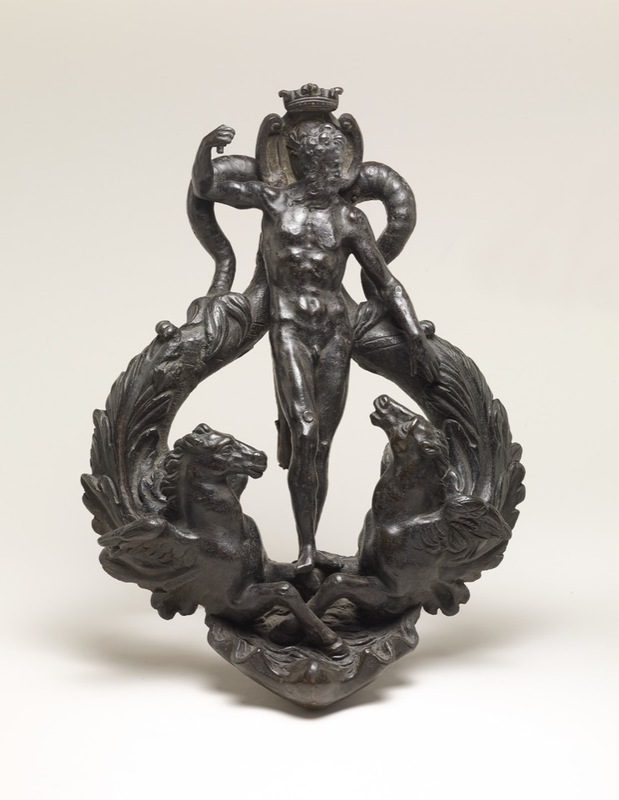 Bronze door-knocker in the form of a naked figure of Neptune standing on a shell between two sea-horses with dolphin-like tails covered in acanthus leaves and curving upwards to meet the head of the god; their tails support a crowned shield with the three fleurs-de-lis of France differenced by a bend. Provenance: Baron Anselm von Rothschild, Vienna, by 1866 (cat no. 173), by inheritance to his son Baron Ferdinand Rothschild (d. 1898). Commentary: There are many versions (although none feature a shield) but the closest comparisons are:-Harvard Art Museum (Fogg Museum), inv. no. 1953.41 attributed to Alessandro Vittoria, formerly in the collection of Nathaniel de Rothschild, and National Trust Collections online, inv. no. 514968 (at Anglesey Abbey, Cambridgeshire) after Alessandro Vittoria. O.M. Dalton, 'The Waddesdon Bequest', 2nd edn (rev), British Museum, London, 1927, no.3.